The UAE's storm cancelled her show, but it couldn't cancel her outfit! Nothing can dampen Dua Lipa’s style, as the singer let her chic outfit shine despite Abu Dhabi’s stormy weather conditions. Last night Dua Lipa was due to perform at the Louvre Abu Dhabi, to celebrate the museum’s first birthday. However, due to thunder, lightning and rain in the UAE, the show was cancelled. Still, the singer didn’t want to waste a good outfit –so posted it on Instagram instead. We can all relate. 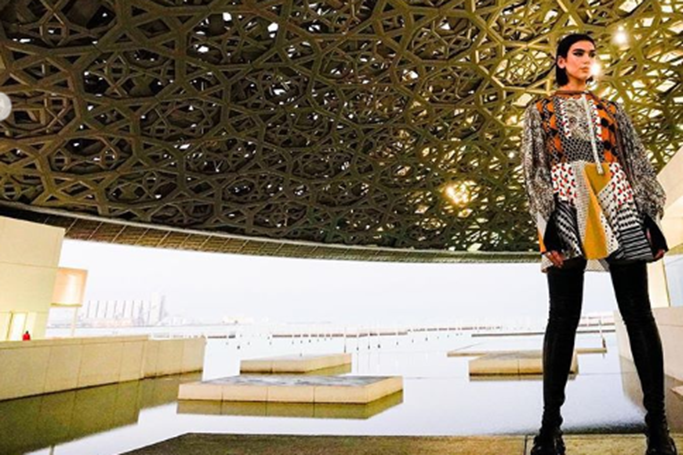 Instead of performing, Dua Lipa explored the Louvre Abu Dhabi and took the opportunity to pose against some of its most Insta-worthy spots. Showing off her patterned “killer frock,” the star certainly didn’t let the rain spoil her stylish look. In fact, it was just as striking as the lightening (sorry)!